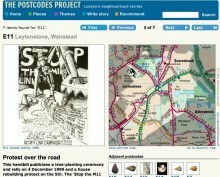 Postcodes is a website commissioned by the Museum of London which enables Londoners to learn about historic objects found in their own neighbourhood. Visitors to the site can also share their stories, memories and photographs, using the website's StoryTeller facility. The stories are subsequently published on the site. We have a strong R&D orientation and have collaborated on a wide range of IST projects under Framework programmes 4, 5 and 6. These enable us to keep our software at the leading edge and to provide consultancy services to clients on future opportunities and knowledge management strategies.